Golden brown and flaky, plus a serving of vegetables! A week or two ago, back when I made that Strawberry and Lime Cremeaux Pie, I also made a made a meat pie for the DH. 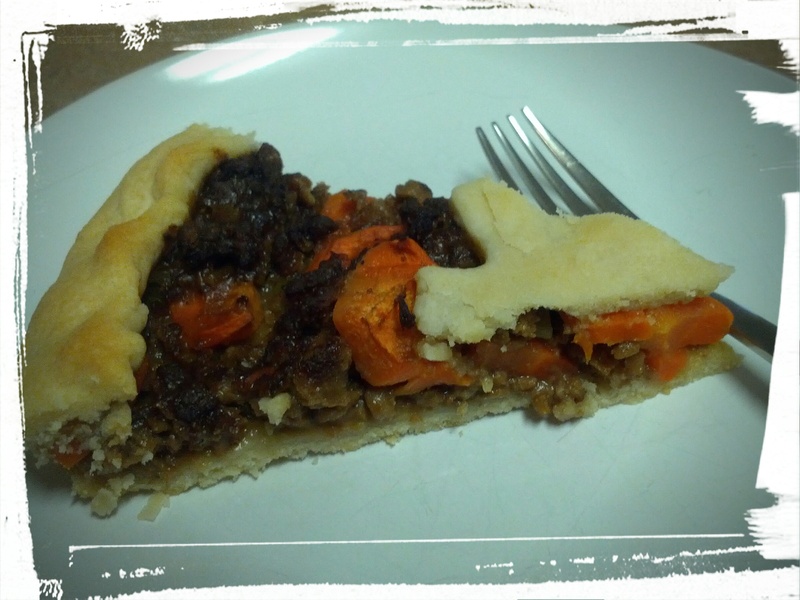 I used my favourite vodka pie crust recipe, and mixed up whatever veggies we had in the fridge with a meat and gravy mixture I had leftover from my Meat Hand Pies. And, bam! Canadian Meat Galette was born! Why Canadian? Because I had leftover dough and wanted to make it into a pretty shape! So I used the biggest cookie cuter I had, a maple leaf. Also, patriotic pride. That too. Why a galette and not a pie? It just has to do with how I shaped the dough. A meat pie generally has a bottom and a top crust, but in this case I didn’t have enough dough to make a top crust, so I turned it into a galette. A galette is just a pie, usually with free-form edges. It’s so easy — no fussing to make super-perfect pie crust edges. Very rustic! At least usually. In the case of this galette, I decided to make it more like a typical pie in that it has somewhat fluted edges, but it’s made in a flan pan…because pretty! It was definitely a hit with the DH. I’m sure it’ll be a hit with you too! Make the pie dough, and roll out, reserving a small piece of dough. Place dough into a flan pan (or use whatever large pan you have — you could even use a cookie tray if you had to), leaving the dough edges sort of over-hanging the pan. Roll out reserved dough and use a cookie cutter to make a shape. Mix up the veggie ground round with the reconstituted gravy. (I used the leftover meat – half the filling recipe – from my Meat Hand Pies.) Chop up the celery and carrot and stir into the meat mixture. Press the meat mixture into the pan. Fold over the edges and flute if you want. Place dough in shape of cookie on top. Bake in a 450 degree oven until pastry is golden. The pie is easily made — no finicky crust here! Just fold over the edges. Serve it with a green salad, and you’ve got a tasty, healthy dinner, that looks pretty too! Obviously this recipe is pretty flexible. You could make it with real ground beef, add in some sautéed onions, and some other root vegetables. If you make it, post a comment below, and let us know what ingredients you used! Next Post: Continuing on with the pie theme, most likely a Cranberry Crackle Tart from my bake-a-long group. I can’t decide whether to make the jam base from scratch or to use store-bought jam. What do you think? What wins out, convenience or taste? Post-Pub Edit: Do link-ups bring in the web traffic? I try it out by linking up here! This entry was posted in Pies on March 31, 2015 by Margaret. So pretty! And tasty! And veggie-licious! If you’ve been following along on my blog, you’ll know that I have some Middle Eastern heritage, so I grew up eating things like hummus on a regular basis. (Of course, my mum being very much an international cook, I also grew up eating things like Thai Green Curry, Borscht, and Poffertjes on a regular basis. I have no Thai or Russian heritage, in case you were wondering. I do have some Dutch heritage though.) At any rate, growing up and eat a lot of Arabic foods, means that I have a definite opinion on what a certain dish ought to taste like. Like baba ghanoush. Also known as eggplant dip. I like it when it’s creamy and smoky, with a tang. Pair that with warm pita, and it’s yum-city! I’ve been reading up on the anti-inflammation diet, as I’m trying to figure out how best to manage my IBS, and I came across Jessica Black’s book, The Anti-Inflammation Diet and Recipe Book. And lo and behold, there was a Baba Ghanoush recipe in it, and I had two eggplants in the fridge! Of course I had to try the recipe! It’s this one, in case you want to try it too. So I made it. I have to say…I did not like it. I’m not sure if it was because the recipe was made to be anti-inflammatory, or whether I made an error in the mixing of it, but the DH was not a fan either. So I doctored it! I mixed it with some garlic balsamic dressing I had lying around the house, and then added some “zeit o zaater”. What the what? It literally means olive oil and thyme. Basically I sprinkled some olive oil (the really good stuff, that some relatives sent me) and a (standard in the Middle East) thyme/sesame/sumac mixture over it. It was delicious! I took a picture and sent it to my dad. I immediately got a response. “Margaret. How could you mix the baba ghanoush with zaater. You know what are you mixing? You are mixing baked eggplant with thyme. It is not mixable.” He was horrified. I stand by my innovation. 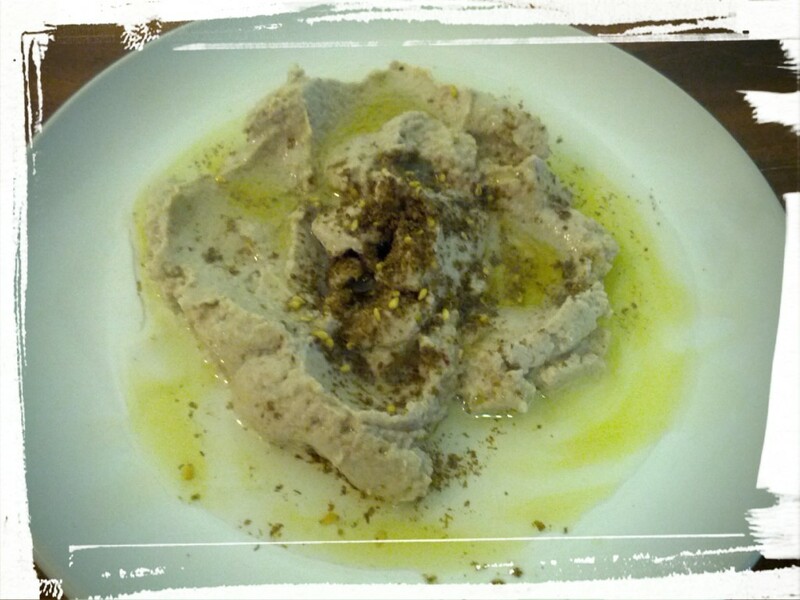 Do you have a favourite baba ghanoush recipe? Let me know in the comments! Maybe this will be my new kitchen Odyssey. Next Post: That Meat and Veggie Galette I’ve been teasing you all with, for real this time. It’s a-gonna be worth it! This entry was posted in Memories of Meals Past, Vegetarian Side Dishes on March 26, 2015 by Margaret. Plated and seconds away from consumption! As my regular readers know, I’m part of a group baking our way through Dorie Greenspan’s cookbook, Baking Chez Moi. It’s all about Parisian French desserts, and can I just tell you? Yum! Some of the recipes are super-intricate, time-consuming, knock-your-ballerina-flats off, and others are surprisingly quick, like today’s recipe! This week’s recipe is Crispy-Topped Brown Sugar Bars! It’s a shortbread-type crust, topped with chocolate, and sprinkled over those layers is a layer of…whatever you decide. 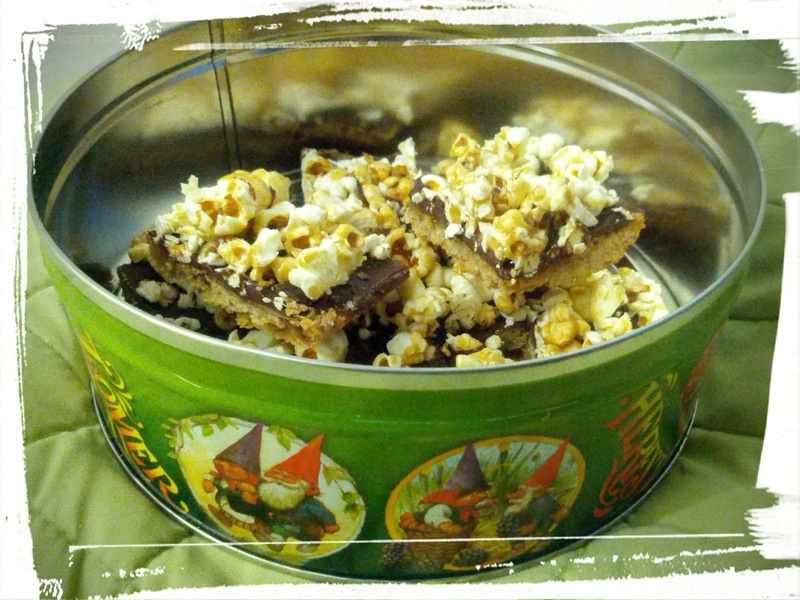 Dorie suggests caramelized Rice Krispies, but says that dried fruits or shredded coconut is another option, and that even popcorn could be used. When I read that, I knew immediately what I was going to do! I don’t have any Rice Krispies in my house that I could caramelize, and I doubt that caramelized Raisin Bran would taste the same, so I made up a batch of my favourite Caramel Corn to top these bars with. And, as per usual, I realized while baking that I had run out of one of the staples needed (white sugar) so I just substituted something else in (more brown sugar). I used my favourite Callebaut chocolate chips, because they melt so nicely on the tongue (apparently, that’s due to the higher cocoa fat content). As I said above, this week’s recipe is really quite quick! Especially compared to the Pink Grapefruit Tart we made a few weeks ago, or the Gingerbread Buche de Noel we made around the Christmas holidays. All you do in this recipe is blend the crust ingredients together, press it into a prepared pan, bake, top with chocolate, and sprinkle with your toppings. Really, it’s the work of half an hour! Although I will say that it depends on the toppings — the caramel corn takes about an 1 hr. and 20 minutes to make (but an hour of that is just baking time). Dough, post-smushing. Now with zebra-stripe-esque finger imprints. And apparently also lumps of butter. And brown sugar. Eh. Almost perfect is good enough! I’m sitting on my sofa typing this on my laptop, and waiting for the caramel corn to finish up baking to a crispy crunch in the oven, so that I can pop the crust in to bake. A number of the other bakers in this bake-a-long said that the crust should be baked for a shorter period than what Dorie recommends, but I guess it depends on your oven, and your crust preference. Dorie keeps talking about ‘the French bake’, which is where you brown your pastry so that the butter flavour comes out more. I love the idea, but not the actuality, so I shall be cutting down on my baking time! Ooh, the kitchen timer went off! I’m going to see how my caramel corn is doing! So, as I was typing this, I was hearing a scratch-scratching noise coming from the darkened kitchen (the DH has already gone to bed. I’ve said before that I’m a night owl, right?). I looked in the kitchen. The DH was happily helping himself to a bowlful of caramel corn. Me: Nooooo! I’m making that for a recipe! DH: But I want it! DH: Noooo! Where did you hide it? Sometimes as I make these Baking Chez Moi recipes, I feel like the Pied Piper, except with baked goods! But enough with the chit-chat. What about that delicious square?!? Some squares set aside for work tomorrow. Possibly. In my gnome-riffic cookie container! The recipe verdict: Is…ok. I like the idea, but the execution just didn’t do it for me. Maybe the caramelized Rice Krispies would have been better. 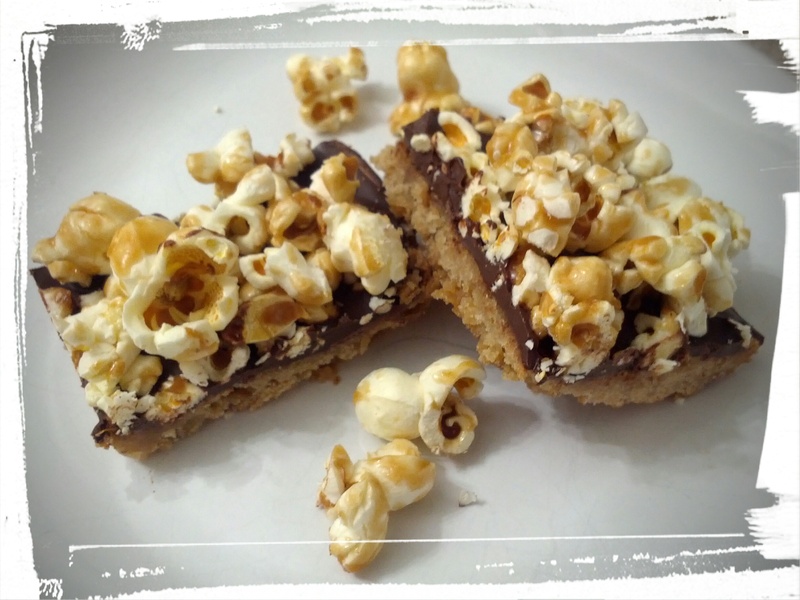 I found the base a bit too buttery and crumbly for my taste, and the mouth feel of the popcorn combined with the rest of the square just…wasn’t my favourite. I packed some to bring to work tomorrow, but I’m of two minds — it’s not the best thing I’ve ever baked, and yet it’s still a nice coffee break munchie. Hmm. I’ll sleep on it and decide tomorrow! Edit: I’ve thought about it, and I think if I made them again, I’d made the caramel corn recipe with half, or even a third of the popcorn, but with the same amount of caramel. I think a crunchier, caramel-ier topping would be a better balance for the base. Thoughts? 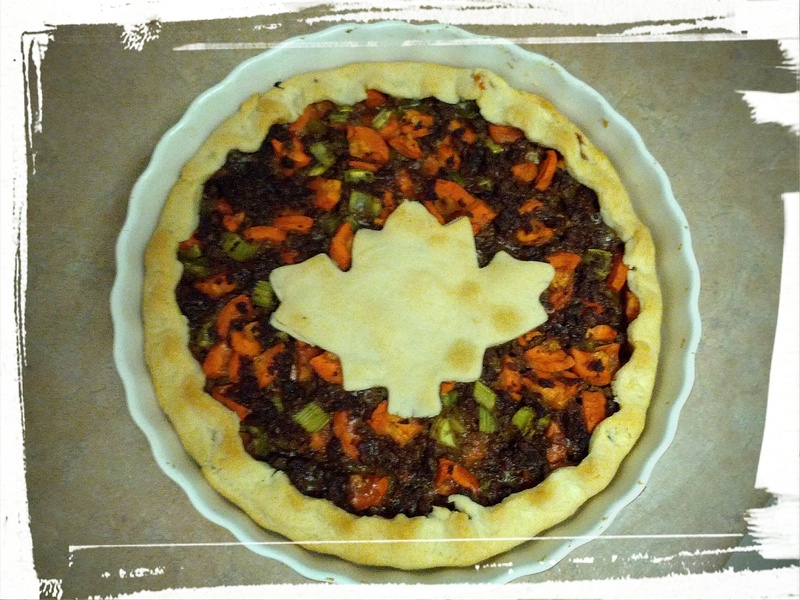 Next Post: Probably my Canadian Meat-and-Veggie Galette! The DH devoured it. Would be a fabulous Thanksgiving dish, come to think of it! This entry was posted in Cook-a-Longs R Us, Desserts Not Otherwise Categorized on March 24, 2015 by Margaret. Today being Throwback Thursday (and therefore time for a Memories of Meals Past post), I’m going to write up a recipe for a pie I made last weekend. I went to a St. Patrick’s day party last Saturday, and all the guests were supposed to bring drinks, but seeing as it was also Pi Day, I decided to bring a pie instead! I looked around my kitchen and tried to figure out what sort of pie to make. I usually have frozen fruit in the freezer, so I looked in there and found some strawberries from when I last went berry-picking. I also was craving some sort of creamy, custardy pie, and having made Dorie Greenspan’s Pink Grapefruit Tart recently, which had a cremeaux base (a sort of thick custard), I decided to add a layer of lime cremeaux. Why lime? It’s what was in the fridge. Yup, last minute pies mean that you use what you’ve got! The pie dough itself was my favourite vodka pie crust, with a combo of butter (for taste) and shortening (for flakiness) in the dough. I tried a new pie edging technique, and learnt about the necessity of blind baking. You see, I was starting to run short on time because I was also making a Canadian meat galette for the DH (recipe to come in a future post), so I tried to cut out the blind baking part when baking the pie crust for the cremeaux pie. The bottom of the pie bakes up all bubbly and stuff, which I don’t care about since it’s being topped with stuff, but the sides tend to sort of slide down and become lop-sided. Not exactly the picture of perfection, although it tastes perfectly delicious. That’s some fancy edging, ‘yo! 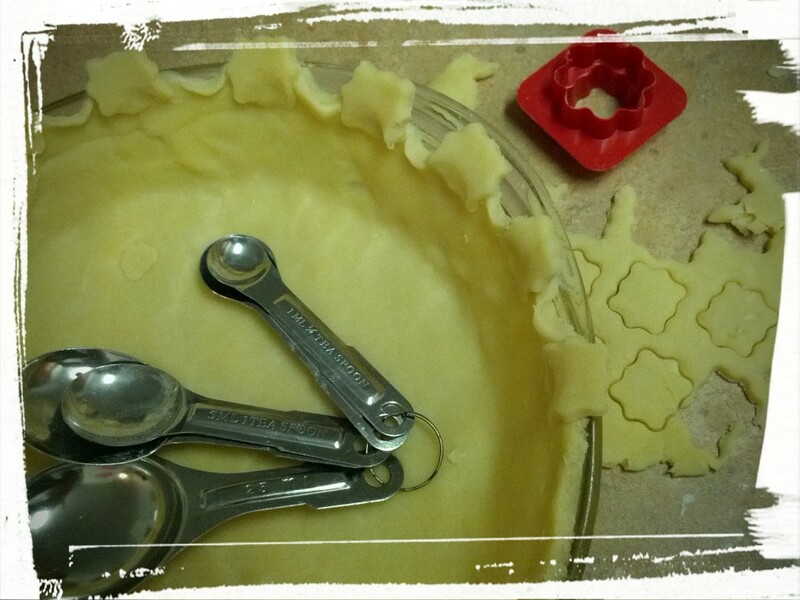 Using my vintage Tupperware cookie cutter. So here’s the recipe! Learn from my mistake and blind bake the dough, though! Roll out the dough and transfer to a pie plate. 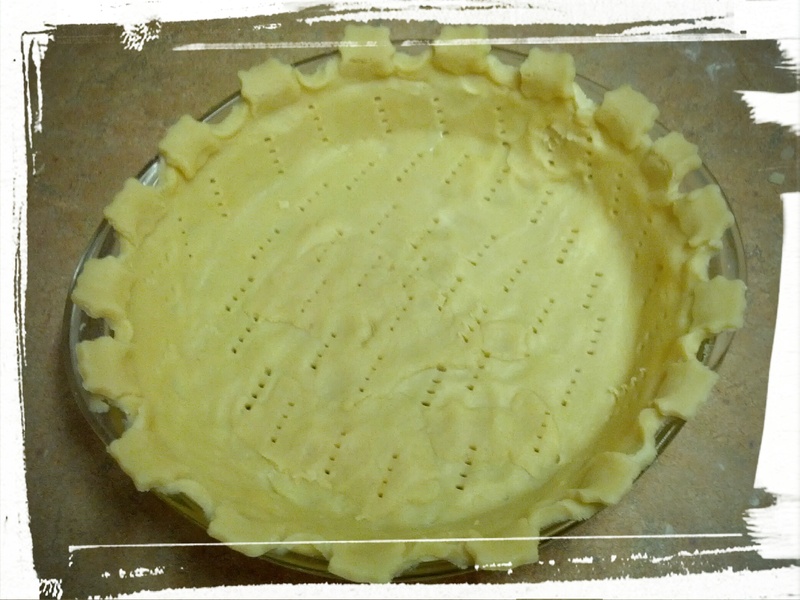 Crimp the edges in a satisfactory fashion (I did half crimping and half cookie cutter cut-outs — was pretty!) and blind bake in an oven at 450 degrees until golden. 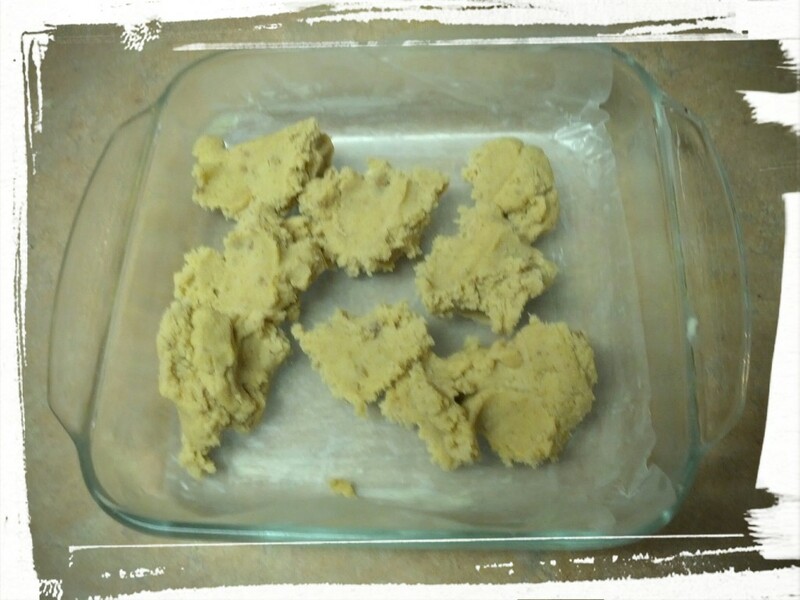 Remove baking weights (I use dried chickpeas) and let cool. Fancy pie crust is fancy! Remember, blind baking is your friend! Mix lime juice and 1/2 c. sugar together. Over medium heat, stir in eggs and cook until thickened, stirring continuously. This will be a while but don’t walk away from the stove. When it’s nice and custardy-thick, you can pour it into a blender. Take gelatin (less one tsp.) and mix it with 1/2 c. water until dissolved. Add that to the mixture in the blender and blend. 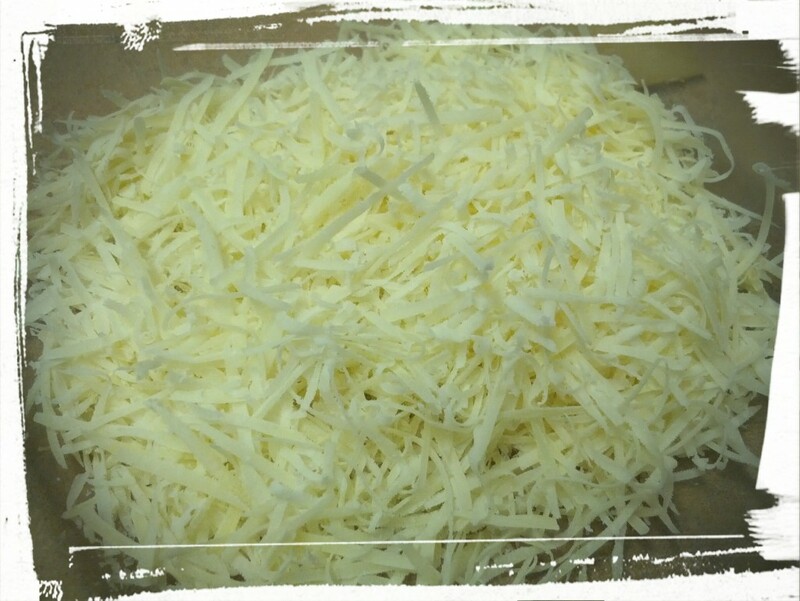 Then add in the butter, a few chunks at a time and blend til it’s all smooth. You can add in the cream and blend again. Pour it into a bowl, cover it with plastic, and stick it in the freezer for a good 30 minutes, or until it’s thick enough to stand a spoon in. Not thick enough? Stick it back in the freezer. 🙂 I know that this isn’t the standard way to thicken a cremeaux, but eh, it works and it saves time. While the cremeaux is thickening, you can mix the frozen strawberries with the remaining sugar, and add in the remaining tsp. of gelatin (after you’ve mixed with the remaining water and let it ‘bloom’). Stir the mixture occasionally over medium heat until the strawberries are defrosted and the glaze is sticky and gelatinous. To put it all together: spread the lime cremeaux into the cooled, baked pie crust. 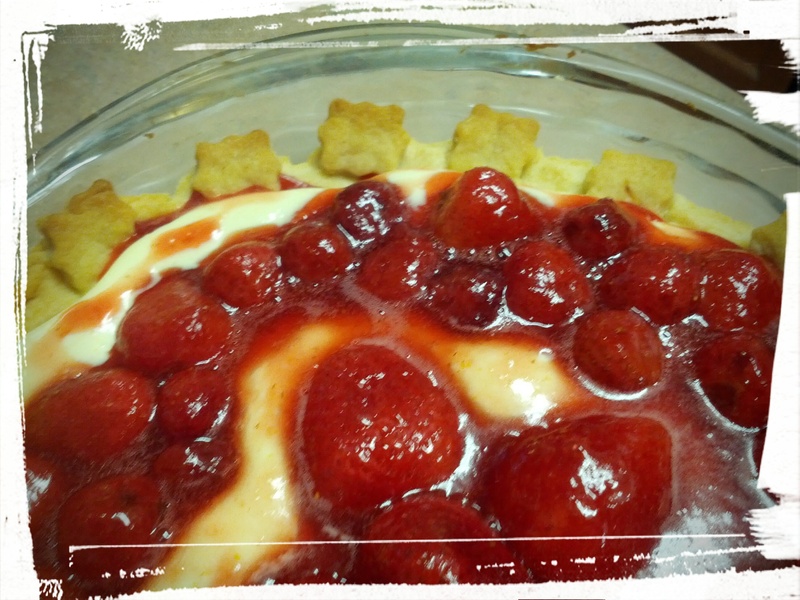 Place the strawberries in a nice design on top and gently pour the syrupy glaze over the whole thing. Let sit in the fridge until the glaze is set. And dig in and enjoy! Yum! 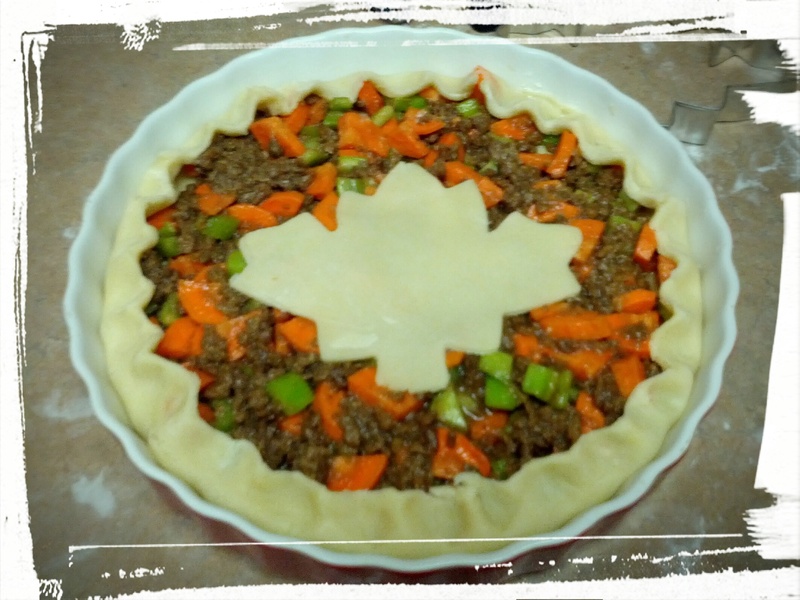 This entry was posted in Memories of Meals Past, Pies on March 20, 2015 by Margaret. 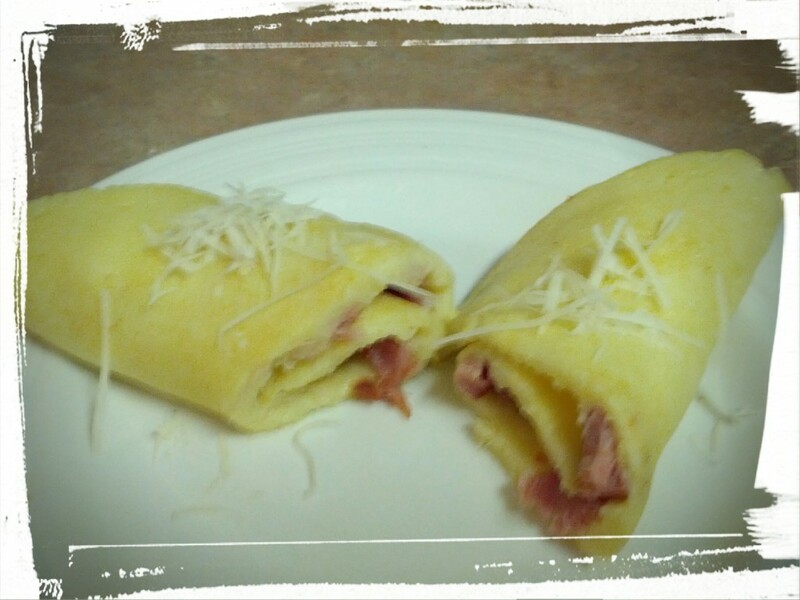 My Oma’s Pancake Recipe, and more of that Everlasting Ham! Savoury crepes — delicious all year round! I was ill a few weeks ago and after recovering, the only thing that I even felt remotely like eating, was my Oma’s (grandmother’s) pancakes. My mother always made these pancakes for Pancake Tuesday, with savoury ones for the dinner and plain ones with sugar for dessert. Mmm…pancakes! As the DH is a meat-lover, I made his batch with parmesan and some ham from that never-ending-ham. We still have a container of this ham in the freezer, by the way. The DH was eating ham every day for weeks and thought he had finally eaten the last bit. But no! I saved the last container to use for future casseroles…and these crepes! Want to make some yourself? Here’s my Oma’s recipe! I have no idea where she got it from, but it must be at least 50 years old at this point. I’ve converted it from the metric system to the more commonly used Imperial system. Mix all ingredients in a blender. 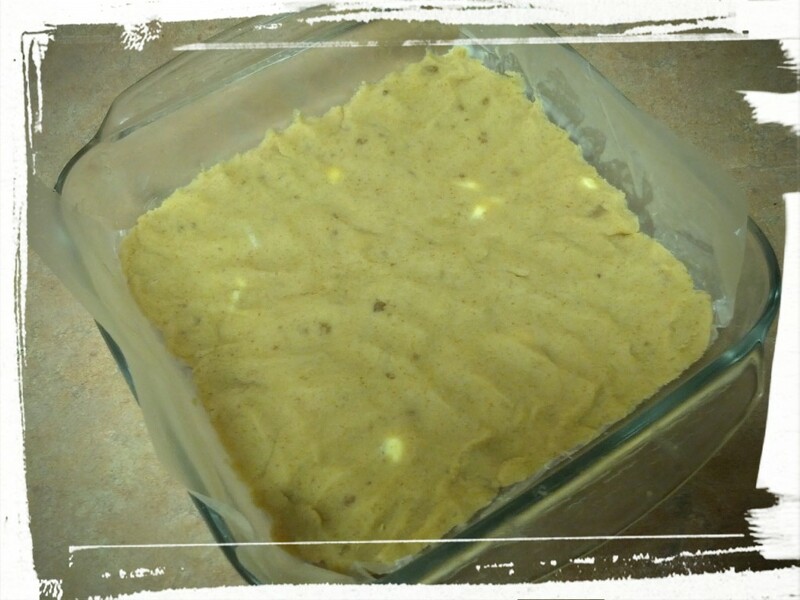 Heat butter in a frying pan over medium to medium high heat until sizzling. Pour enough batter into the pan to cover most of the bottom Sprinkle filling of your choice on top. When top is set and bottom is golden, flip. Continue frying until both sides are golden. Flip onto a plate and roll up. Repeat with remaining batter. Dig in and enjoy! This will make 4 good-sized pancakes/crepes. FYI, you may need to add a bit more milk to the batter for the 2nd and 3rd pancakes, as the flour will settle a little and make each pancake progressively thicker. Also, the butter is a large part of the delicious flavour, so feel free to be liberal with it! Play around with the toppings/fillings! Last year for Pancake Tuesday, I made pancakes filled with Gouda cheese for dinner, and then made pancakes with sweetened ricotta cheese and macerated strawberries for dessert. Finger-licking good! What’s your favourite pancake topping/filling? Let me know in the comments! Next Post: Strawberry-Lime Pie, because Pi day may come and go but a good pie is always welcome! This entry was posted in Breakfast Foods, Desserts Not Otherwise Categorized, Vegetarian Main Dishes on March 15, 2015 by Margaret.